www.privateairny.com Private Air New York | Fall 2018 39 WEALTH MANAGEMENT estate plan, and then assume it never needs to be looked at again – as though it's good forever. Successful families are thinking about tax planning and their estate plan all the time. 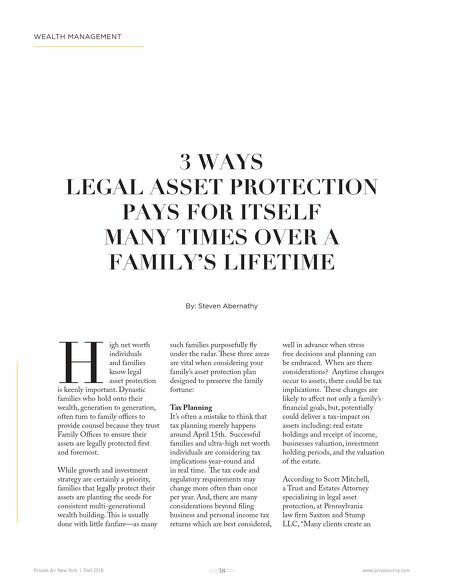 It is strongly advisable for these families to always be mindful of the provisions of their estate plan, and just as they meet with a doctor or dentist for a check-up each year, they should be meeting with their estate planning attorney and tax professional every year to have a "check-up" on their existing estate plan". Legacy Planning As wealth changes hands from one generation to another (or more likely, one spouse to another), the legal transfer of wealth may present challenges to both families and individuals—particularly if there are complex structures. ese may be a blessing and a curse if one is attempting to "manage the family's assets from the grave." Counseling families on philanthropic strategies, estate planning, and the proper establishment of purposeful trusts are a few of the services our clients use to formulate a clear game plan and more importantly to ensure the family's assets are used for purposes, which the family embraces. According to Scott Mitchell "the decision becomes whether to use a domestic or non- domestic asset protection trust… with further consideration around which state offers the best asset protection for their trust." Business Management It is never an easy decision to sell a business—particularly one that has been in the family for generations. Whether you are selling—or buying—a business, succession planning, optimizing value, tax planning, and intelligent transaction structuring all need to be considered and optimized based on the family's long-term goals. When the appropriate legal asset protection structures are in place early on, as a business grows and expands, moving forward is easier. 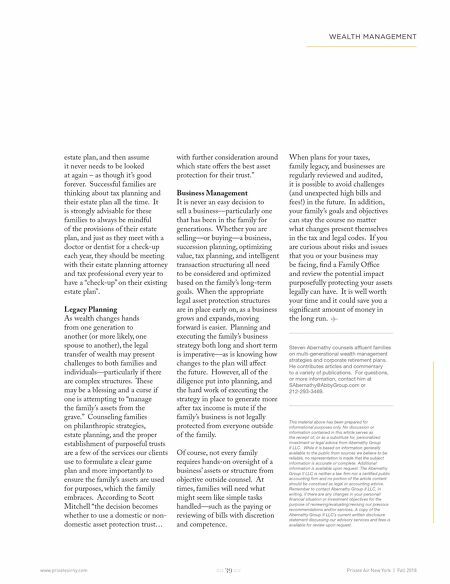 Planning and executing the family's business strategy both long and short term is imperative—as is knowing how changes to the plan will affect the future. However, all of the diligence put into planning, and the hard work of executing the strategy in place to generate more after tax income is mute if the family's business is not legally protected from everyone outside of the family. Of course, not every family requires hands-on oversight of a business' assets or structure from objective outside counsel. At times, families will need what might seem like simple tasks handled—such as the paying or reviewing of bills with discretion and competence. When plans for your taxes, family legacy, and businesses are regularly reviewed and audited, it is possible to avoid challenges (and unexpected high bills and fees!) in the future. In addition, your family's goals and objectives can stay the course no matter what changes present themselves in the tax and legal codes. If you are curious about risks and issues that you or your business may be facing, find a Family Office and review the potential impact purposefully protecting your assets legally can have. It is well worth your time and it could save you a significant amount of money in the long run. Steven Abernathy counsels affluent families on multi-generational wealth management strategies and corporate retirement plans. He contributes articles and commentary to a variety of publications. For questions, or more information, contact him at SAbernathy@AbbyGroup.com or 212-293-3469. This material above has been prepared for informational purposes only. No discussion or information contained in this article serves as the receipt of, or as a substitute for, personalized investment or legal advice from Abernathy Group II LLC. While it is based on information generally available to the public from sources we believe to be reliable, no representation is made that the subject information is accurate or complete. Additional information is available upon request. The Abernathy Group II LLC is neither a law firm nor a certified public accounting firm and no portion of the article content should be construed as legal or accounting advice. Remember to contact Abernathy Group II LLC, in writing, if there are any changes in your personal/ financial situation or investment objectives for the purpose of reviewing/evaluating/revising our previous recommendations and/or services. A copy of the Abernathy Group II LLC's current written disclosure statement discussing our advisory services and fees is available for review upon request.